The KEY Ingredient For Financial Security In Your Coaching Business - Coach & Grow R.I.C.H. Want to know the KEY ingredient for achieving financial security in your coaching business? Unfortunately TOO FEW coaches get this and take it seriously. A large and responsive following of subscribers will give you a never-ending flow of clients and customers. Your email list IS your financial security. And then take really good care of your subscribers so they stay on your list and become lifetime fans. 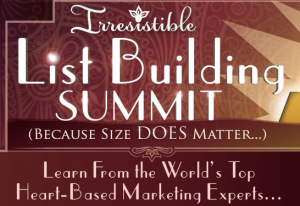 Come learn the secrets to building (and keeping) a profitable email list at the Irresistible List Building Summit. We’re going to share our best insider secrets (the stuff you never hear people talk about) on how to attract 1,000’s of your ideal clients online. This is one of the most valuable, and comprehensive list-building trainings you can receive and you can get it for FREE starting in just a few days.